CHEONGJU, North Chungcheong Province ― People might think nobody likes hard work. Yet, employees at one of Hynix Semiconductor’s key factories appear to be different. They are very busy due to rising orders but do not complain. Two things appear to make a difference in the NAND flash memory line of Hynix here. One is that the firm has finally found a stable owner who is ready to invest and the other is that its business prospects are good thanks to strong demand. ``We’ve gained much confidence in the fact we are able to grow under the new ownership and developments in chip-making technology,’’ said a technician on a NAND line in Cheongju. Last November, Korea’s biggest telecom operator SK Telecom agreed to purchase a 21 percent of stake in Hynix to diversify its business and hopes to complete the deal soon. After the merger, SK Telecom has vowed to increase investment in Hynix by up to 20 percent to 4 trillion won this year, from 3.4 trillion won in 2011. Half the amount is expected to be earmarked for NAND flash expenditures. The plans are expected to boost Hynix’s bottom line, headed by Chief Executive Kwon Oh-chul, amid explosive demand for NAND-embedded digital devices such as smartphones, tablets and e-books. In this climate, the Hynix technician in his 40s said he is not the only one that is optimistic about the company’s outlook in terms of profit and market share. ``I’ve been through some ups and downs at this factory. But the atmosphere is very good. The `can-do’ sprit is seen everywhere, a feature we’ve lacked for quite some time,’’ he said. NAND lines of the world’s No. 2 memory chipmaker are strictly off-limits to outsiders, especially journalists for security reasons. However, a host of Hynix officials were available at the chip-producing factory here, about 135 kilometers south of Seoul and they had similar stories. ``An increasing number of workers are paying more attention to product commitment and on-time delivery. The advent of new ownership breathes fresh energy into the whole factory,’’ another worker said. The management of Hynix and its owner SK Telecom will be very happy with this change considering the significance of the NAND business in the corporation’s business portfolio. 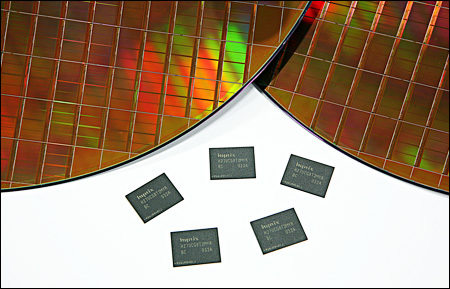 Hynix runs dynamic random access memory (DRAM) chip lines in Icheon, Gyeonggi Province and Wuxi, China. 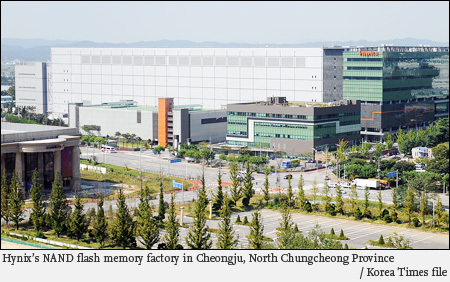 The plant in Cheongju is mainly tasked to handle NAND flash memories. DRAMs and NANDs are categorized as memory chips. While they read and write data, NAND flashes can store data, even when switched off. NANDs are regarded as the ideal products for high-end portable digital devices. Hynix had 21.6 percent of the global DRAM market, trailing only Samsung Electronics with 44.5 percent, as of the end of the third quarter of last year, according to data from consultancy DRAMeXchange. Its global share in NAND flashes was some 10 percent. ``We will regain NAND shares we lost, previously,’’ Hynix CEO Kwon said recently. Apple recently released a list of its major chip suppliers for the first time, with Hynix included on it. Hynix is investing more to increase the output of value-added chips by using thinner chip-making technology such as mobile DRAMs and advanced NAND flash memories and analysts say this year’s priority for Hynix should be NAND. Hynix spokesman Son Kyung-bae confirmed the firm will increase capital expenditure for the new line. He declined to unveil the investment breakdown, though. ``More manufacturers will release more smartphone variants and tablets of various sizes and that is giving more business chances to chip suppliers like Hynix,’’ a senior company official said. Hynix plans to announce its fourth quarter results in early February when Kwon will unveil this year’s investment details to analysts and reporters, officials said. The chipmaker is forecast to have earned 2.4 trillion won up to the end of the fourth quarter of last year, though it will suffer some 200 billion won in operating losses due to the industry’s oversupply and weak chip prices as the prolonged debt-crisis in Europe and sluggish economic recovery in the United States sapped demand for consumer devices. There are other positive signs for the chipmaker. ``This year is likely to be a time when the DRAM market consolidates a little bit more,’’ said Jim Handy from Objective Analysis. ``Hynix is likely to live through the 2012 downturn. This company has a remarkable penchant for surviving against the odds. This implies that Hynix will neither be acquired nor go out of business in 2012," the Analysis said. The memory chip market is volatile and the profitability of chip suppliers is heavily dependent upon macroeconomic moves. If prices are high amid buoyant demand, then they charge buyers more. But if prices maintain weak amid a bad economy, then they sell chips below market prices to lower inventories, hurting their bottom line. Hynix, along with Samsung Electronics, has the capability to effectively handle fine-tuned memory chips specifically with below 20-nanometer processing technologies. That means the company is better positioned to report relatively better than Japanese and Taiwanese rivals even during an industry downturn. HSBC Securities said in a report that the brokerage expects Hynix to significantly cut its operating losses to minus 22.4 billion won in the current quarter thanks to the stabilization of DRAM chip prices and the continuing healthy demand for NAND flash memory chips. ``Hynix narrowed technology gaps in NANDs with its main rivals within three months by successfully transitioning to 26-nanometer level technology. With more financial support from SK Telecom, Hynix is expected to expand its output for NAND flash chips, bringing it to increase its global share to 16 percent by 2013,’’ said Jin Sung-hye, an analyst at Hyundai Securities, a local brokerage.